So here we are again, Autism Awareness Week. Every year people go to great lengths to fundraise, stage events, write posts and generally try to raise the profile of what is arguably already the most well-known condition in childhood. In 2016, you can't scroll through your social media feed without drowning in a deluge of posts from people with autism, their parents and charities. It's also becoming far more widely diagnosed in adults, myself included, often after they have experienced a long life-time of feeling 'apart' from the rest of society, watching others socialise and fit in easily and wondering how the bloody hell they do it. 50% of autistic people and family members sometimes or often don’t go out because they’re worried about how people will react to their autism. What this means is that people living with autism are not finding a compassionate world outside their door, whether it's the tutting onlooker in the supermarket or at the school gates, the GP or teacher with poor autism training, or the relatives who only apparently possess perfect children of their own. All the awareness-raising in the world will be water off a duck's back to these people, until the day they are faced with it in their own family. With the most recent US statistic of 1 in 68 children with an ASD, this is likely to happen sooner or later. In the meantime, it's an education in practical compassion and improved professional training that's needed, because the world we live in means these numbers are not going to get better anytime soon. On my "banging on about stuff" blog, NotAsAdvertised, I posted a video showing our #FamilyFacesofAutism at the weekend and mused about the genetics of autism, which is where I believe the causes surely lie, whether inherited or as a result of an environmental impact on the unborn child, baby or toddler. I'm not going to get into the politics of autism vaccination; not that poisoned chalice, thanks very much, but I do know that in our family, autism is very much an inherited phenomenon. When Son1 was born, I knew he was different right from the start, even though I had no experience of parenthood. He was louder, more alert, slept less, was more sensitive, just "more" in every respect. My dreams of him listening adoringly as I patiently explained how to do this or that were soon in ruins, along with many household objects he got his hands on. Son2 was the complete opposite but we still knew that he was not going to be a straight-forward child. They are still opposites, both with quite different symptoms of autism and this is exactly why understanding of what autism is has proved so difficult to get across to those who know little about it. Everyone has their own idea what autism 'looks like' and if your child doesn't fit that, then you are clearly mistaken in thinking they are autistic, whether or not they have a cast iron diagnosis. I remember feeling like Son1's class teacher suspected I'd somehow bribed the experienced paediatrician who'd diagnosed him, just so I could excuse my son's non-compliant behaviour. In my view, one of the most common difficulties in getting a diagnosis or support for autism and other invisible conditions, is being believed. Unless your child has a clear cut case of classic autism (and even then it's not straightforward), getting the diagnosis, followed by securing the right educational help, seems to be a never-ending battle. The decade since my sons were diagnosed does not seem to have changed things much either. If anything, the government seems hell-bent on making things more difficult for disabled adults by cutting spending on disability and incapacity benefits by, on average, £295 million a year over the next five years. Meanwhile, the mainstream media can't make up its mind about disability as they scream of "scroungers" one minute, then wailing about the deaths of people whose benefits have been stopped the next. Added to this, the curbs on charity fundraising and campaigning is just another way that dissenting voices are being silenced and vital funds for supporting the vulnerable are being strangled. The DfE has spent hundreds of millions on the SEND reforms but the most important aspects for families - training for teachers and the change in culture needed to make co-production work - have been left behind. The Carter Review into teacher training came well after implementation of the changes on an unprepared and often bewildered education, health and social care sector. The National Autistic Society's campaign for teacher training in autism that we highlighted last week, underlines this need. The development of the reforms included a lot of involvement from parents, voluntary groups and children themselves. But it seems that they were only listened to over the details, such as delivery of services and trying to makie support holistic. This, in itself is fantastic, but services do not provide themselves and teaching does not happen by itself. It is people that matter. It's all very well putting the family at the centre, but if they are surrounded by professionals who are still thinking in the old ways of them and us and service-centred provision, it's just going to end up in chaos. Exactly as it has. The NAS has a good Autism Day theme this year, I think. Instead of going on about the fact that autism exists, they have chosen to highlight one particularly disabling aspect - how sensory or information overload can impact a person with autism. Speaking for myself, I would actually say that it isn't so much "too much" information, but when you cannot control it. The problem comes when you do not have the ability or capacity to turn it on or off or to get away from it when you want to. You can't just tune it out or cope with it and this leads to overload. Some things that bother me include: the hiss of medium wave radio, the constant crowd noise from football on the TV, the noise from many people talking in different conversations in one place, the overhead lights of a supermarket, unexpected noises such as a lawnmower or drill cutting through the quiet of a Sunday morning (or whenever I lie down for a nap, it seems), the smell of Parmesan cheese, the scratch of itchy socks, underwear or labels... and so on. And I'm a growed-up - imagine what it's like for a child or young person! I have ways to cope, but that's another post. However, the onlooker, the relative, the teacher or doctor has to be interested to receive this education of what life with autism is like and then motivated enough to do something about it whether that's simply offering to help the struggling parent, to reading a book or website about ASD, attending a course or promoting autism-friendly policies wherever they are. That's the struggle in a society that sometimes seems intolerant of difference and too busy to care. Things are changing, I think, and education events are important to keep chipping away at the stone-hearted among us. 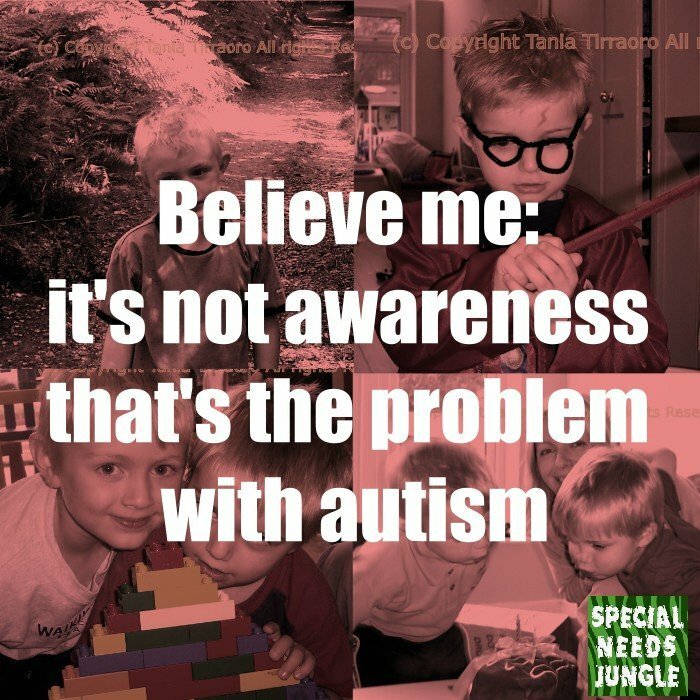 That's why SNJ continues to exist- to inform, to educate and to promote awareness and understanding. Thanks Steph for that and sorry it’s taken this long to reply – memory loss problems! I often worry that I’m seen as a bit scary rather than ‘loveable’, but I’m not really, just focused on the issues when I have to be. The rest of the time I’m a bit of an idiot. Just ask Renata! Ha ha!